If you're annoyed with having to pay for a simple password manager for your browser, you might want to check out this free version of LastPass which has won numerous awards. Simply said, LastPass is the best password manager. Usage is very simple and requires you create an account on their web site. LastPass free supports all major Internet browser, specifically Firefox, Internet Explorer, Safari, Opera and Chrome.. Version 4.25.2 is a freeware program which does not have restrictions and it's free so it doesn't cost anything. 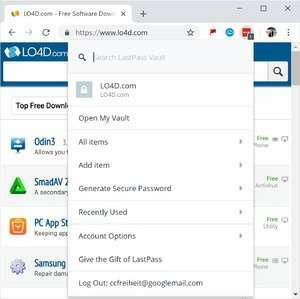 For security reasons, you should also check out the LastPass Password Manager download at LO4D.com which includes virus and malware tests. Additional screenshots of this application download may be available, too. LastPass Password Manager has a presence on social networks.